Have you had beer can chicken? If not, you really need to try it. Because of the way it’s cooked, it’s crispy on the outside but the beer keeps it moist and tender on the inside. But I don’t drink beer! No problem. You can use alcohol free beer or pop and it works just as well! The last time I made it in the oven, things went awry and it stayed in there a GOOD HOUR longer than it should have. It was still moist and fall off the bone tender and delicious! It’s pretty much foolproof. 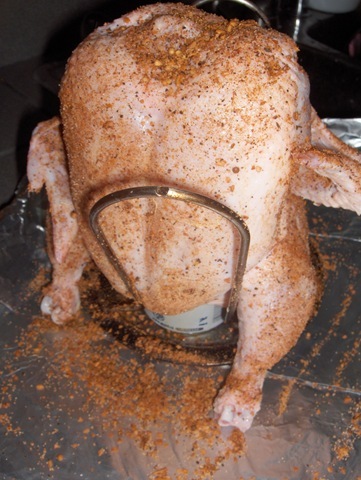 Let’s begin with the spice rub because it really is the key to a tasty beer can chicken. You can buy a prepared spice rub. I highly recommend any of the Grill-Mates rubs made by McCormick’s. No this post isn’t sponsored by them. I just happen to really like their products. However, I also make my own spice rubs and this one is a favourite. You can vary the ingredients in the spice rub according to what you prefer. Experiment with it! This handy dandy stand is great for helping to balance the chicken. You don’t need it though. Just be sure to place carefully in the roasting pan or on the grill using the legs to balance. This usually makes enough rub for 2 whole chickens. Make sure to rub it all over the chicken, getting into all the creases and folds (under the wings and such). You can rub this on just before you cook the chicken but letting it sit on the chicken for a while (as you would with a liquid marinade) makes it even better. I usually apply the rub in the morning before I’m going to cook the chicken, although you could even do it the night before. You need about a 4 lb. chicken, a little olive oil (I use about a tablespoon), the spice rub, a can of beer – well actually you only need about half a can of beer (or alternative), and some cooking spray for the basics. Remove the giblets from the chicken if needed, rinse the chicken inside and out, and dry off with paper towels. 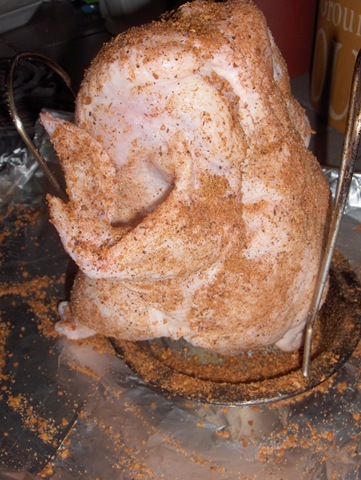 Give the chicken a rubdown with some olive oil and then with the dry rub. I like to use some of the rub on the inside of the chicken too for added flavour. Spray the beer can with some cooking spray for ease of removal. I also spray the grill surface to prevent the rub and juices from sticking to it. If I’m using a beer can chicken pan or using a roasting pan or something similar to make this in the oven instead of the grill, I also cover those with foil and then spray with cooking spray to make the cleanup much easier. Place the beer can on a flat surface and shove the cavity of the chicken down over the beer can. I have a special beer can chicken pan that has these supports on each side to help hold the chicken up. It came with two pans in a package and was only about $5 at my local hardware store. I know they are widely available at stores and online. They aren’t a necessity though. 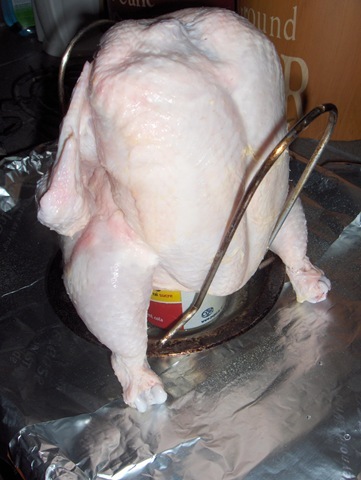 Just be sure to use the chicken’s legs like a tripod to help balance it. Cook the chicken over medium-high indirect heat, covered for about an hour and a half – I usually check it at the one hour point and then every 15 minutes thereafter until it’s done. You want the internal temperature reading with a meat thermometer to read 165 degrees F in the breast area and 180 degrees F in the thigh. If cooking in an oven, I use a setting of 375 degrees F and cook it for about an hour and a half. On a grill, you want medium-high heat for about an hour and a quarter. Let the chicken rest for about 10 minutes prior to serving to allow the juices to settle back into the meat. First of all, remember you don’t HAVE to use beer. You can use a can of pop with wonderful results as well. I sometimes even dump out what was in the can and put in some broth, wine, or fruit juice instead. You can even make a liquid marinade and put that in the can. You just want to be sure to have about a half a can of liquid so that as it cooks it will boil up and the liquids will be absorbed and infused into the chicken. You can also toss in some other things in the can of liquid. If I’m doing a rub that has lemon pepper in it, then I cut up some small bits of fresh lemon and push those down into the can. Cutting up bits of fresh garlic and onion and putting those in there is another great way to add flavour to the chicken. With Cornish game hens, it is really delicious to put tomato paste in the can with some Italian herbs. This is such a simple recipe that it’s perfect for those busy weeknight meals! Or anytime you want some chicken that is tender, moist, and scrumptious! For a side, I often cube some potatoes and toss them in olive oil. Place them on a double piece of foil with some chopped onion and a few pats of butter. Wrap up, creating a foil packet, and pop that into the oven or onto the grill with the chicken. It can go in about halfway through the cooking time. Add a salad or veggie and you’ve got a complete easy meal! Tasty Tuesday: How Do You Stuff It? You had me at Beer HAHA! Seriously though – this looks so good! I am trying to get my daughter out the door to get some food right now so this is really making me drool! Adding the items to my shopping list! It’s SO good and so simple! I hope you like it.